As written above, the course is MQA-approved, runs over five full days (Monday 11 May to Friday 14 May 2009) in our training center in Quatre-Bornes and costs Rs. 15,000 per participant. Of course, those who are eligible can have refunds from the HRDC. Naturally, I’ll be the one doing the training and you can find what previous trainees have felt about the course (and me) on our Testimonials page. 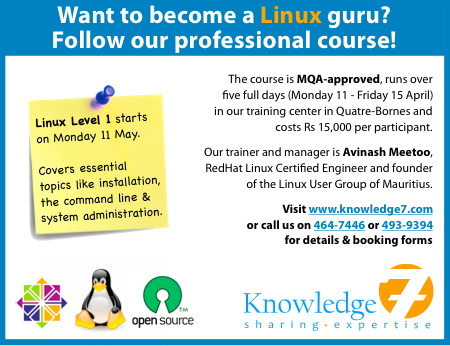 Do not hesitate to visit our website or to go directly to the Linux Level 1 page for additional information. Also, do not hesitate to call me on either 464-7446 or 493-9394 for any additional information you may require. Be quick! Places are limited. 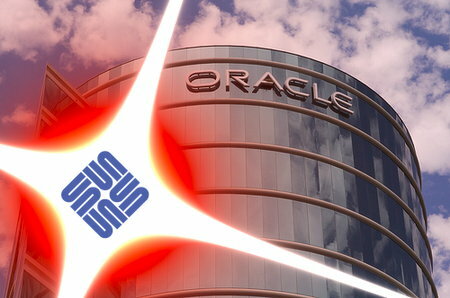 Oracle to buy Sun Microsystems!!! Sun Microsystems and Oracle Corporation announced today they have entered into a definitive agreement under which Oracle will acquire Sun common stock for $9.50 per share in cash. The transaction is valued at approximately $7.4 billion. Utility computing is the packaging of computing resources, such as computation and storage, as a metered service similar to a traditional public utility (such as electricity, water, natural gas, or telephone network). This system has the advantage of a low or no initial cost to acquire hardware; instead, computational resources are essentially rented. Customers with very large computations or a sudden peak in demand can also avoid the delays that would result from physically acquiring and assembling a large number of computers. Cloud computing is a style of computing in which dynamically scalable and often virtualised resources are provided as a service over the Internet. Users need not have knowledge of, expertise in, or control over the technology infrastructure “in the cloud” that supports them. The concept incorporates infrastructure as a service (IaaS), platform as a service (PaaS) and software as a service (SaaS) as well as Web 2.0 and other recent technology trends that have the common theme of reliance on the Internet for satisfying the computing needs of the users. I can easily imagine Oracle using hardware technology from Sun and Solaris to provide utility computing services (Sun already has a grid.) And, of course, I can easily imagine Oracle deploying its business suites (eBusiness Suite / Peoplesoft / Siebel / J.D. Edwards) and a lot of other applications on that infrastructure. Exciting times ahead. Let’s hope that everything which is open source remains truly open source. Yesterday, four people providing the The Pirate Bay service were sentenced to 1 year of emprisonment and a $905,000 fine each. The reason? For assisting in making copyright content available. From an ethical point of view, I am against copyright violation. I believe that those who create should decide whether people should pay or not to get access to their creations. Some of them will decide that people need to pay (that’s fine!) and some will decide that their creations can be redistributed freely (that’s excellent!) And, from an ethical point of view, it’s important that people respect the will of creators or risk demotivating them. And without creations to enjoy, what is our existence worth? To be frank, I only buy a few albums now because, well, obtaining them (more or less) freely is so painless. Music companies could have made their music collection downloadable at a very low price (say, of the order of Rs 100 ($3) per album) and I’m sure that a lot more people would have bought albums. In fact, if the music companies had intelligent people at their helm, they would have embraced P2P instead of condemning it because P2P solves the technical problem of delivering content in a scalable way. I have to agree. Downloading music is a means towards discovering new horizons. It’s not an end. It’s not about filling our hard disks with thousands and thousands of MP3 and never listening and appreciating them. Music is about emotion. Not about codecs.